While trying to capture some ants and aphids in my garden, I noticed this little spider (about a half inch across) with a large fly. 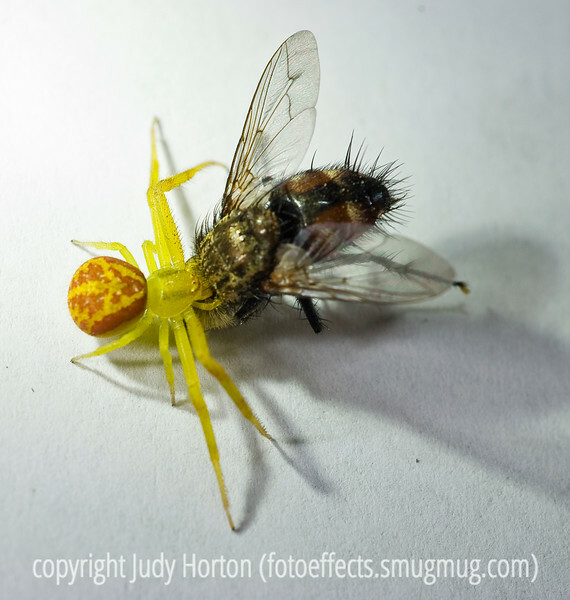 The spider was already sucking the insides out of the fly, which was already dead or paralyzed. I managed to bring this pair into the house, where I experimented with a number of different lighting arrangements...trying to get the details of the spider, while maintaining a good dof. It was very difficult and I never succeeded in getting the kind of sharpness and clarity that I wanted. However, I think the subject is sufficiently interesting to use one of these images for my daily. The other images from this effort are in my macro gallery (under the "other" category). I think for this shot, you should probably view it in the original size. The whole time I was shooting this the spider was moving around on the white paper. Thanks for your kind comments on my iris pic today. There were a lot of wonderful images posted today. By the way, has anyone heard from Dave Dedman? I haven't seen anything of his in a while and I know he had pneumonia. I sure hope he's ok. If some of you are communicating with him, give him my best wishes. This is a well done macro, Judy. On a photographic level, brilliant. On another level, ughh.